Voice is her instrument, guitar her back-up and music her passion. Lorna Miller is a life-time performer whose musical material is deeply rooted in traditional American music. At the same time she interprets contemporary music and writes herself. From old blues, country and western tunes to folk ballads, Lorna performs the songs that inspire her and tell a story. The great songwriters and performers of the last century and the present, such as Memphis Minnie, Billie Holiday, Ella Fitzgerald, Jimmie Rodgers, Woody, Sons of the Pioneers, Patsy Montana, Johnny Cash, Bob Dylan and Neil Young and all those great Texas musicians and the Delta blues guys are the inspiration. Their songs and Lorna’s are drawn from human experience, historical and personal. Good stories can be found in every good song whether it’s cowboys, hobos, soul searching journeys of hardship or love. 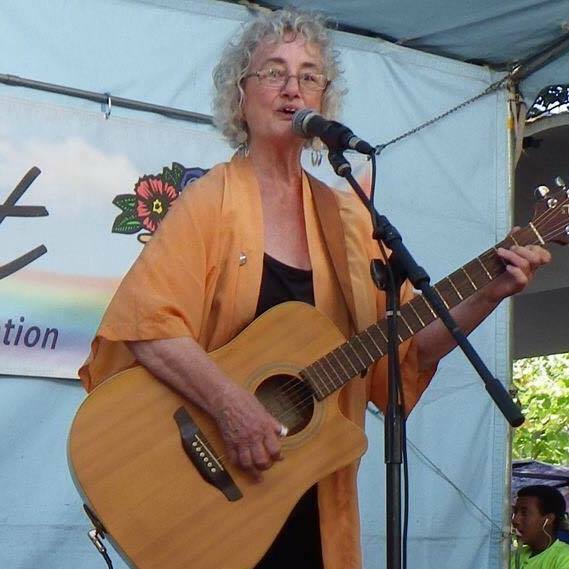 Lorna sings these stories using her slide guitar and acoustic guitar and now and again with some friends to back her up. She adopted the name “Western Hummingbird” and it fits. Lorna was my guitar teacher when I was first learning how to play, and now, many years later, she remains my dear friend and mentor. She’s the best! You can’t get better than Lorna – she is fantastic. She’s more than a local talent. i can’t get “Hello” out of my head. If you know Lorna; you love her. If you haven’t met Lorna, then it’s high time you do! Fondest regards to a great, sweet soul. Lorna leaves you believing you can grow tomatoes yourself! She’s that good. Can’t wait to hear her lovely voice over and over.